By now you must know about the jets of ice particles blasting out of Saturn’s moon Enceladus, and maybe have even heard about the recent discovery of water vapor issuing forth from Jupiter’s frozen moon Europa. But now we know of another spray-happy world out there: Ceres, which at 591 miles across is our solar system’s smallest dwarf planet but the largest object in the asteroid belt. New findings from ESA’s Herschel Space Observatory reveal that this diminutive world is jetting water vapor out into space, proving both that it has an icy surface and that water does in fact exist in the main asteroid belt, which stretches out between the orbits of Mars and Jupiter. Read more below: “This is the first time water vapor has been unequivocally detected on Ceres or any other object in the asteroid belt and provides proof that Ceres has an icy surface and an atmosphere,” said Michael Küppers of ESA in Spain, lead author of a paper in the journal Nature. The results come at the right time for NASA’s Dawn mission, which is on its way to Ceres now after spending more than a year orbiting the large asteroid Vesta. 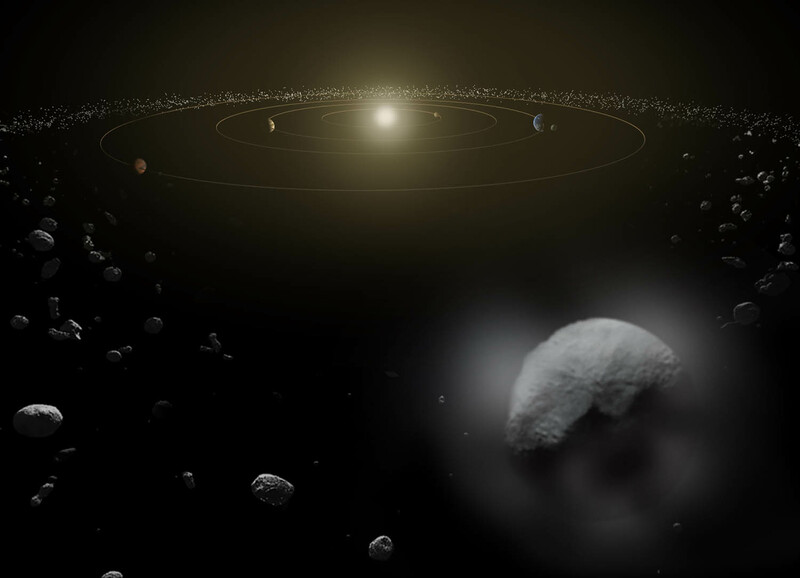 Dawn is scheduled to arrive at Ceres in the spring of 2015, where it will take the closest look ever at its surface. “We’ve got a spacecraft on the way to Ceres, so we don’t have to wait long before getting more context on this intriguing result, right from the source itself,” said Carol Raymond, the deputy principal investigator for Dawn at NASA’s Jet Propulsion Laboratory. “Dawn will map the geology and chemistry of the surface in high resolution, revealing the processes that drive the outgassing activity.” Although Herschel was not able to make a resolved image of Ceres, the astronomers were able to derive the distribution of water sources on the surface by observing variations in the water signal during the dwarf planet’s 9-hour rotation period. Almost all of the water vapor was seen to be coming from just two spots on the surface. Variability in intensity of the water absorption signal detected at Ceres by ESA’s Herschel space observatory on 6 March 2013. Copyright: Adapted from Küppers et al. “We estimate that approximately 6 kg of water vapor is being produced per second, requiring only a tiny fraction of Ceres to be covered by water ice, which links nicely to the two localized surface features we have observed,” says Laurence O’Rourke, Principal Investigator for the Herschel asteroid and comet observation program called MACH-11, and second author on the Nature paper. The most straightforward explanation of the water vapor production is through sublimation, whereby ice is warmed and transforms directly into gas, dragging the surface dust with it, and thus exposing fresh ice underneath to sustain the process. Here is what scientists think is happening: when Ceres swings through the part of its orbit that is closer to the Sun, a portion of its icy surface becomes warm enough to cause water vapor to escape in plumes at a rate of about 6 kilograms (13 pounds) per second. When Ceres is in the colder part of its orbit, no water escapes. The two emitting regions are about 5% darker than the average on Ceres. Able to absorb slightly more sunlight, they are then likely to become the warmest regions, resulting in a more efficient sublimation of small reservoirs of water ice. Previous Post Wake Up, Rosetta!